Art of the Home aioli sauce French potato salad is a variation of the classic French potato salad – la piémontaise. Tossed with a Provencal aioli sauce instead of a mayonnaise, this French potato salad brings a sunny touch of Provence to your table. It is perfect for a picnic or barbecue. Check our detailed aioli sauce French potato salad and Art of the Home suggestions below. Enjoy and bon appétit! Wash potatoes and cook with the skin in salted boiling water. Set aside to cool off. Cook hard boiled eggs. Cover with cold water and set aside to cool off. Prepare aioli sauce by following directions from Art of the Home Aioli Sauce Recipe. When both potatoes and eggs have cooled off, heat up chicken hot dog in boiling water. After 5 minutes, turn off heat and cover. The hot dogs will plump up and they’ll be more juicy. Peel potatoes and and remove shell from eggs. Cut potatoes, tomatoes, and eggs in small pieces and place in a large serving bowl. Add in minced shallots. Slice hot dogs in small rounds. Before serving, toss and taste. Add salt and pepper to taste. Wine suggestion: when serving an aioli sauce, consider a white wine which pairs well with the garlic flavor of this potato salad. A chilled rosé works great as well. 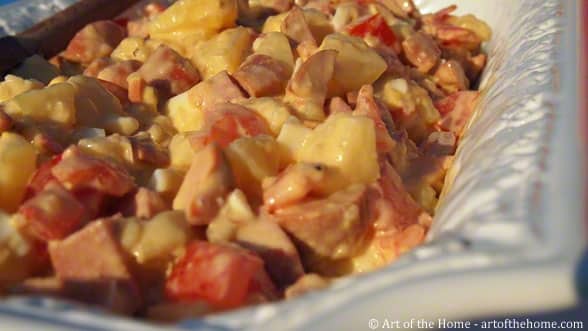 Barbecue Side Dish: this Aioli sauce French potato salad makes a great side dish for any barbecue or is a great alternative to the classic potato salad for any potluck.